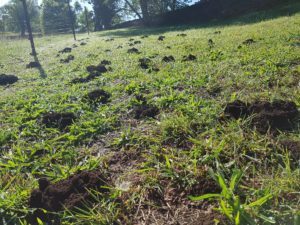 "Local Family Business, Serving Locals"
Funnel Ants – Dirt mounds in your lawn? One pest that seemingly makes a massive move after the rain on the Mid North Coast is the dreaded Funnel Ant. Getting their name from the funnel shaped dirt mounds that infest your lawn, these pests are often left to multiply into large colonies. The reason that the funnel ant is so prominent after heavy rainfall has nothing to do with heightened activity. In fact the ants area always around, foraging through and destroying the root base of your lawn, undermining paths and paving and creating an uneven ground surface. In fact, the reason that mounds seem to appear or get worse after rain is that the rain ‘settles’ the dirt, filling their tunnels. With their tunnels full of dirt, the ants get back to work excavation it all out again and creating the funnel shaped mounds they are known for. Why are funnel ants bad? Their workings often damage the root structure of the grass, causing it to die and be patchy. The mounds are messy and unsightly. The mounds cause damage and premature break down of lawn mowers and lawn mower blades. the excavations and mounds cause your yard to have an uneven surface. Funnel ants can other undermine pavements, driveways and external hot water systems. This pest is often simply ‘put up with’ unnecessarily. Local Pest Experts can complete funnel ant treatments from as little as a few hundred dollars for a small house yard covered by a 6 month service warranty. Often our customers have had great results, well exceeding this 6 month period, with one customer having her yard serviced on a bi-annual basis with excellent results. What will you see after a Local Pest Expert, pest funnel ant treatment? Your overall lawn health will improve dramatically. The funnels will wash in and simply, not reappear. Your neighbours will look at your yard with jealousy and desire. The best and worst thing about funnel ant treatments is that the results often go unnoticed, you simply just don’t have the annoyance of the mounds on you lawn, dirt coming up through the cracks in driveways and pavement or your lawnmower and blades being destroyed. I’ve read enough, book me in!